As far as delis go, according to Seto, Grand Lake Kitchen is neither an old-school East Coast deli, nor a traditional Russian-Jewish deli, nor any other clear-cut category. “We try to have little of everything for everyone,” Seto said, pointing out that their menu stresses local and seasonal ingredients, but also includes traditional deli items, like an old-fashioned potato salad. The overall concept was rooted in what Seto and Wasem saw as a lack of “fast and delicious” options in a neighborhood populated mostly by sit-down restaurants. When it comes to high-quality grab-and-go food items, however, there has been a real void — especially after Kitchen 388 (a few blocks further down Grand Ave.) discontinued its weekday daytime hours at the end of last year. “So [the restaurant] was actually born out of the two of us being hungry,” Seto said. 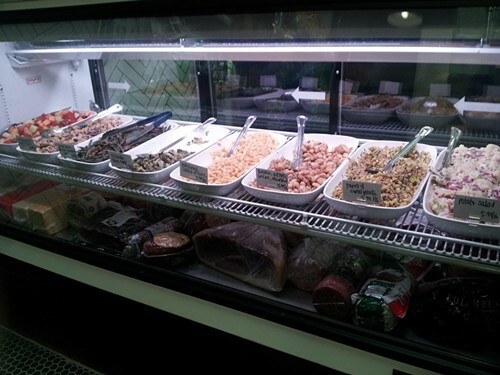 One of the most prominent features of the restaurant, then, is a well-stocked deli case full of interesting salads and other prepared foods — there’s an escarole salad with capers and Castelvetrano olives; there’s a great macaroni salad with tuna and mayo. On the sandwich menu, Seto said she and Wasem are especially proud of the Oyako (a Japanese-inspired open-faced egg salad sandwich with crispy chicken skin) and a cheddar bratwurst sandwich featuring sausage from 4505 Meats and pickled red onions to cut through the richness of the meat — I tried that one; it was a pretty tasty sandwich. The deli also has a small grocery section stocked with housemade pickles and granolas, but also a carefully curated selection of healthy (or healthy-ish) snacks — and even baby food. Oh, there’s also beer and wine. The project has been in the works for some time now, previously under the name “La Grande Jatte Kitchen.” Seto explained that the construction process ended up taking nine months to complete, as she and Wasem had to install a full kitchen in what had been an office space. A couple days after opening, the restaurant was looking good. It boasts a twelve-seat diner-style counter for customers who want to dine in. There are also a handful of seats out front for al fresco dining when the weather’s nice — I imagine those will make for good people watching when the nearby Saturday farmers’ market is in full swing. The location is fortuitous, too, in that it’s just a few steps away from a popular gym — lots of foot traffic, lots of folks looking for a quick post-workout meal or snack. 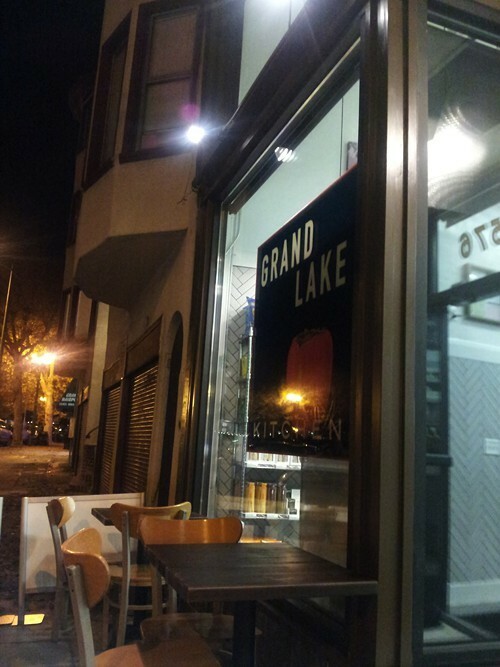 For now, Grand Lake Kitchen’s hours are Monday to Saturday, from 10:30 a.m. to 7:30 p.m. The restaurant is closed on Sundays.